Yesterday, I blogged about how to create a favicon for your blog. As promised, today’s post will be about how to add your favicon to your blogger (blogspot) blog. 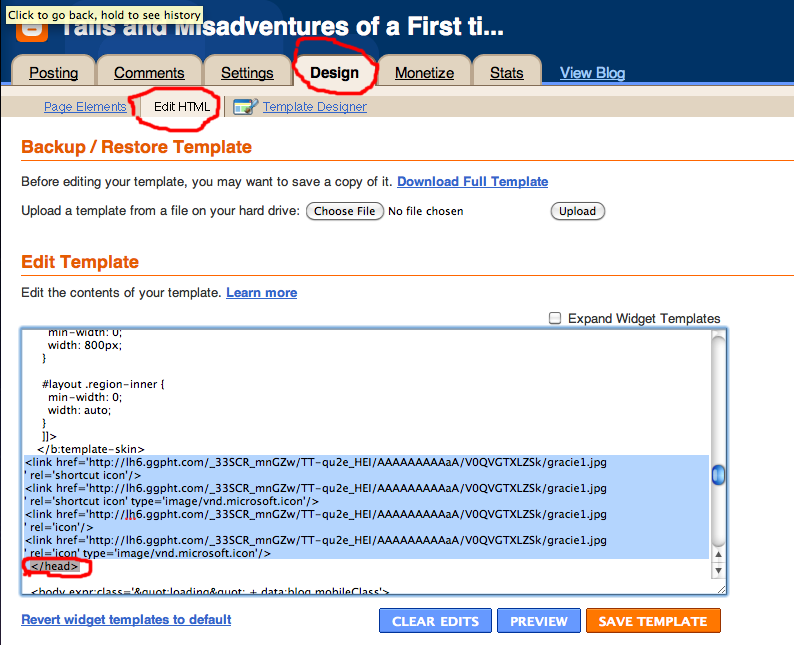 The process isn’t hard, but it does involve adding a code to your Blogger template. For this tutorial, I will use Gracie, my shih-tzu’s blog (www.tails-misadventures.blogspot.com). If you publish with Blogger, then you should be familiar with the iconic default Blogger.com favicon. It’s the orange and white square logo. Most blogs on the Blogger platform use the default favicon. Here’s what the default favicon looks like. Adding your own custom favicon will help brand your blog, and it makes your blog distinct above the rest. To be on the safe side, save the favicon image that you want to use as a GIF, JPEG, or PNG. You can easily do with this Picnik (www.picnik.com), a free photo editing program owned by Google that gives you the option to rotate, crop, and resize any photo that you want. If you have Photoshop, you can create your favicon and resize the image to 16 pixels by 16 pixels. Save the image as a GIF, JPEG, or PNG. Now that you’ve created the favicon that you want to use, you need to upload it to your image hosting account. I am using Picasa, because it’s owned by Google and the one that I’m most familiar with. As you can see the favicon is TINY once it’s uploaded. You will need to right click to copy the image URL. (Keep this URL handy. You will need it later). 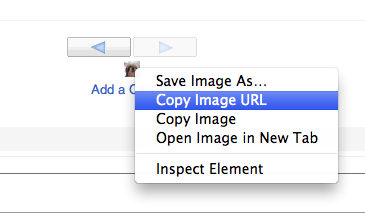 If you use Picasa, your URL will look similar. Now that you have the link code for your favicon, it’s time to tweak your Blogger template to make the Favicon show up. Go to the “Design” tab of your blog, then to “Edit HTML.” Under “Edit Template,” scroll down to where it says </head> and paste your link code immediately before it. Save the template. Refresh your homepage and you will notice that you have a favicon right next to your blog’s URL. Cool, right? Congrats! You’re done! Feel free to Tweet, Digg, StumbleUpon, and share this post with friends, if you found it helpful! thanks for this tutorial..really great help to struggling newbies like me..kudos! Wow! Another excellent guide! Thank you for all the inforand tips that you shared! If you cannot see your favicon after you uploaded, try deleting your cache or history. If you view it from another computer or electronic device and it is there, relax. My computer still won’t show my favicon, but my Nook, iPod, and iPad do! We’re a bunch of volunteers and opening a brand new scheme in our community. Your site offered us with valuable information to work on. You have performed an impressive process and our entire community might be grateful to you. I can’t figure out where to copy the url address, I can’t find it, when I right click it, it doesn’t have one like yours?? I just started my blog today, so I’m very new at this! I used Picassa Web Albums, and right clicking allowed me to copy the image URL..
I’m having the same issue as above ^ any suggestions?! 🙁 can’t make it work..keeps giving me the Error 500..Your template could not be parsed as it is not well-formed. Please make sure all XML elements are closed properly. XML error message: Element type “link” must be followed by either attribute specifications, “>” or “/>”. Thank you SO MUCH for this blog. It was soooooo easy! If you don’t mind, I will be eventually blogging about this. You will get all the credit, but I want to blog my experience if that’s okay. These instructions worked!!! Follow them exactly and it works! I had Rhonnie’s issue with the Blogger sign coming back up but I chose the wrong”head” code. I found the exact code and it works! Thanks a million! wow – never even knew what a favicon was before this. I’m going to install it on my site, now im aware of it, every site i vist seems to have one! Can you edit the HTML of the template? Hi I added the code exactly as shown but with my url and double checked to make sure it looked the same but the blogger logo still shows up. What am I missing? Double check the quotes. You may need to manually retype the quotation marks around the links. That can cause problems for some people. tried that but still no joy? Do you think Blogger has now disabled the ability to change it? That is very strange. I tested it out my instructions when I wrote the post, and it worked for me then. (This was recently, too!) Are you copy and pasting into Notepad? Are there any extra spaces in the code that shouldn’t be there? I am not aware of any changes on Blogger but I am on a Wordpress template now. However, Google has gone through a few changes in recent days. The favicon that I used for this blog post for my doggie blog still works, though. Great info! I’m just learning the ins and outs of making my blog stand out. Thank you for the easy to understand instructions! I can’t wait to try! My blog is at http://www.renouneddesign.com come visit me! No problem. If you have any other questions about blogging, please let me know so that I can write future tutorials to help everyone out. I am always looking for new ideas! Let me know if you have any questions about blogging. I’d be happy to post about them and answer your questions. Thank you for the sweet comment, Caroline! One things I haven’t figured out however is how to make my icon pop up in a reader instead of the blogger icon. Any thoughts?